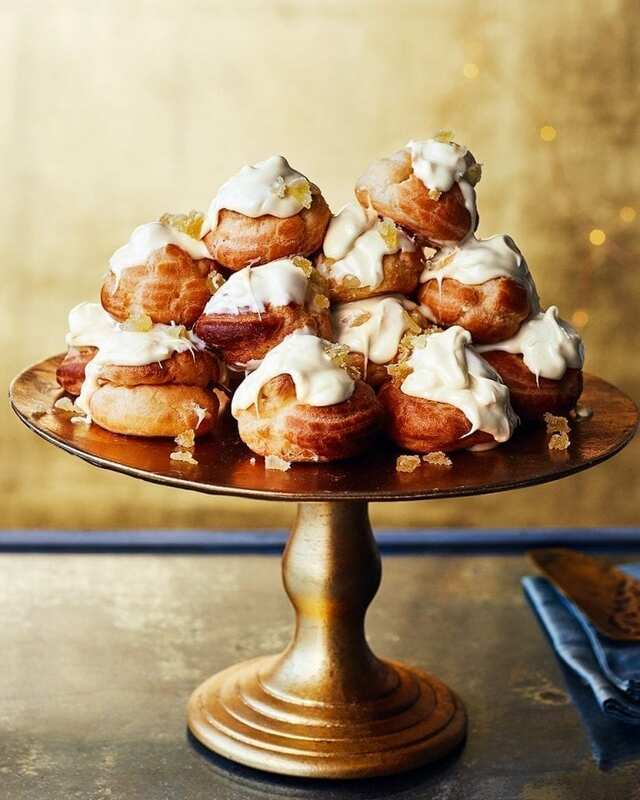 We’ve revitalised this 1970’s classic with these white chocolate drizzled profiteroles filled with an orange and ginger cream. For the choux pastry buns, put the butter and 150ml water in a saucepan set over a medium heat. When the butter has melted turn up the heat and bring to a rolling boil. Meanwhile, in a mixing bowl, combine the flour, sugar and salt then, in one go, pour into the boiling butter/water mixture. Beat strongly with a wooden spoon until the mix clumps together to form a ball that fully comes away from the sides of the pan. Tip the dough into a mixing bowl and use the spoon to spread it up the sides (to help it cool). Leave to cool to room temperature. Heat the oven to 220°C/200°C fan/gas 7. Once the dough has cooled, add the 4 beaten eggs, little by little, only adding more once the previous addition is fully mixed in. The mix will look as though it’s about to split but it will come back together after beating. You might not need all the eggs or you might have to add an extra splash of milk to reach dropping consistency. Transfer the choux mixture to the piping bag fitted with the 1cm nozzle, then pipe 18 buns, each a little larger than a 50p coin with a depth of roughly 3cm, onto each of the prepared baking sheets, spaced at least 3cm apart (36 in total). Use your finger to brush a little of the beaten egg over each one to smooth out any peaks. Bake for 20 minutes, then lift up the profiteroles and use a skewer to poke a small hole in the bottom of each one to let out the steam. Bake for 2-3 minutes more until golden and crisp. Cool on a wire rack. For the filling, put the double cream, grated ginger and orange zest in a large mixing bowl, sift over the icing sugar, then whisk to soft peaks using an electric hand mixer. Poke a small hole in the bottom of each choux bun if the previous ones have closed up. Put the cream into the piping bag fitted with the small nozzle, then fill each choux bun. To make the topping, melt the truffles in a small heatproof bowl set over a pan of barely simmering water (don’t let the water touch the bowl). Remove from the heat and let the melted truffles cool a little. Dip the top of each profiterole in the melted truffle mixture and put on a tray. Scatter over the crystallised ginger and leave the topping to harden. Stack to serve. Choux pastry is ready for piping when it drops easily from the end of a wooden spoon (called dropping consistency). Add the egg (and milk, if needed) bit by bit, beating between additions until dropping consistency is reached. To get the look on our cover, decorate after stacking with extra melted truffles topped with edible gold lustre and extra grated ginger and orange zest. Make the choux buns up to 24 hours ahead and store in an airtight container. If they’re a little soft the next day, warm in a low oven until crisp again.